how to build a low-cost test lab that is well-suited to Imatest Studio users: individual photographers who want to test the quality of their cameras and lenses. It is relatively portable and also useful for photographing artwork. Companies and organizations who use Imatest Master/IS may need a more professional test lab setup. Imatest partners with companies who offer professional lab setup services. Substitutions can be made for most of the parts listed below. Kino Flo FreeStyle 31 LED lights have 8.5×37″ (21.5 x 94cm) panels that make them ideal for providing uniform glare-free illumination for Imatest’s full range of test charts, up to 44×78″ (111.7 x 198cm). 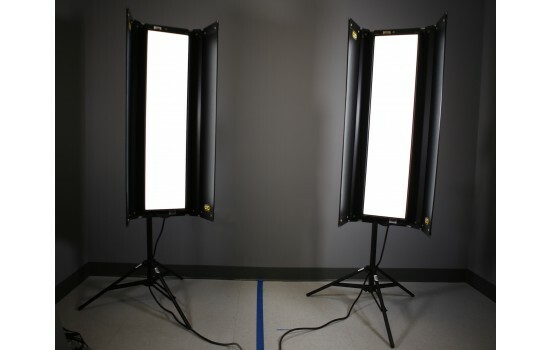 This product is sold as a set of two lights with 30″ stands. Color temperature range can be varied from 2700K tungsten to 6500K daylight, and is dimmable over a 150:1 range. 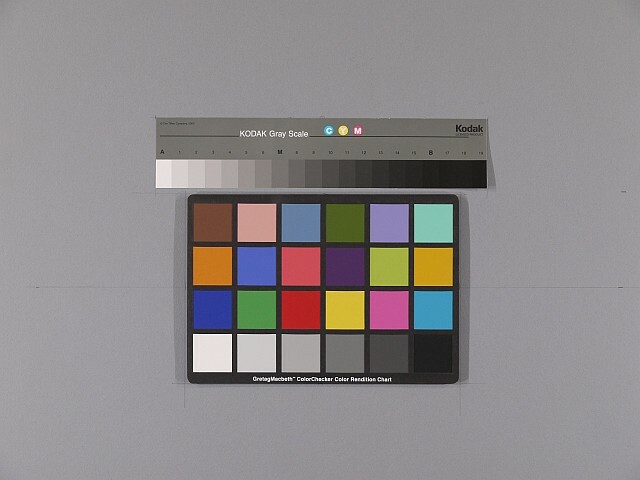 CRI (Color Rendering Index) = 95 is very high. The FreeStyle 31 LED comes with standard DMX and wireless DMX (Lumen Radio®), 24VDC input, and universal voltage input 100-240VAC (1.25 Amps at 120VAC). 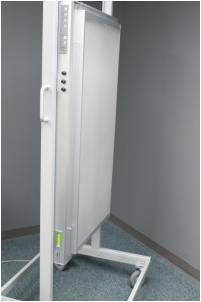 The IQL Reflective Chart Lighting System for Imatest professional lab setups covers up to 40×60 inches (100×150 cm) with good uniformity. Multi-source luminaires (D65, CWF, Incandescent “A”). Fixture. Multiple light sources & dimmers. 3 color temperatures & a variety of intensity levels depending on the positioning of the lights relative to the chart or scene. A light box is needed for transmissive charts, which are generally smaller than reflective charts and can be particularly useful in manufacturing environments. 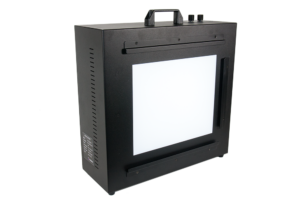 Transmissive film charts have much higher resolution than inkjet charts.The GLX-16 fluorescent light box is shown on the right with an SFRplus chart.See our range of lightbox options in the Equipment Section of the Imatest Store. Our best available lightbox is the Imatest LED Lightbox (shown on the right) available from the Imatest store. It has several advantages over other lightboxes. High quality spectral response. The standard version allows you to choose between 3100K, 4100, 5100K, 5500, 6500, and NIR color temperatures (850nm or 940nm) with a Color Rendering Index (CRI) of 97. Other color temperatures are available as options. Intensity is adjustable via a hardware knob, Bluetooth, or USB, from 30-10,000 lux: a range of over 300:1, making it suitable for measurements from near-daylight to extremely dim light. Options are available with a minimum of 1 lux and a maximum of 100,000 lux. Widely-available LED shop lights provide an excellent solution for Imatest Studio customers whose primary interest is testing camera and lens sharpness. Little assembly is required with the exception of the need to mount them. The disadvantages (compared to professional lighting solutions) is that they’re difficult to dim (not an issue if you’re just testing camera/lens sharpness), have just one color temperature (typically 4000K) and have a relatively low Color Rendering Indices (around 80; still better than most fluorescents). Cheap dimmers should be avoided because they tend to have flicker. Here are some examples (we don’t call them recommendations because there are so many similar lights to choose from). 1000bulbs.com has a large lighting selection of shop lights. This page has several examples. An attractive lighting fixture is ~4 feet (1.2 meters) long, 5000 Lumens (bright) output, 4000K, CRI = 80. Local stores, like Home Depot and Lowe’s in the US, usually have a good selection. The image on the right shows a 4 foot (~1.2 meter) 36W light with Color Temperature = 4000K, CRI = 84 (quite good), and 3200 Lumens output, available from Home Depot. (You wouldn’t need the chain.) It’s just one of many. The BK Precision 615 Light meter (Lux meter) is an excellent low-cost instrument (about $100 USD) for measuring incident light (illuminance). It has a flat diffuser and photopic response (similar to the human eye in bright light). It is particularly useful for measuring evenness of illumination. We purchased ours from Action Electronics, which offers several alternative choices. The BK was chosen over similar Easyview meters because it has a flat (rather than hemispheric) diffuser that better represents the geometry of the flat targets. Readings can be somewhat slow, with settling times around 3-5 seconds. Several additional items can come in handy: a small level, a flashlight (LED models are cool), rulers, a few clamps, etc. A bubble level mounted on a camera’s accessory shoe can be particularly helpful. Irwin Quick-Grip Handi-Clamps work well for attaching targets to the easel. A laser distance measuring instrument is very convenient for measuring precise distances— much more accurate than the measuring tape shown on the right. You can find them for under $100 USD at home improvement chains like Home Depot in the US. 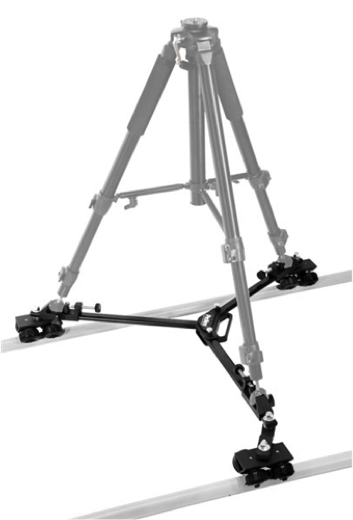 The tripod should be sturdy, easy to adjust, and easy to move. Any good tripod with a pan/tilt head should work; geared heads are much better. Ball heads are not recommended. 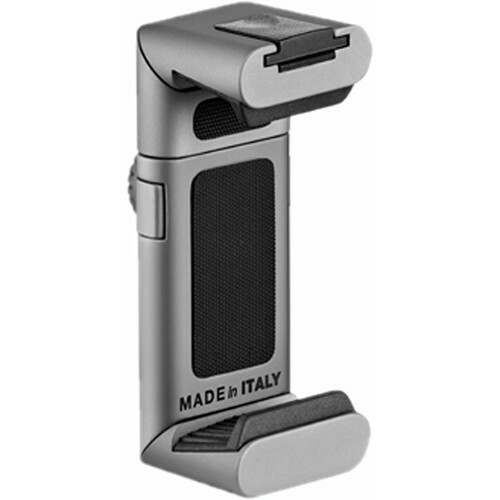 We illustrate a few Manfrotto components, which offer good value for the price. These represent typical choices; many more are available to meet special needs. Manfrotto 475B tripod legs with geared center column – supports 26.5 lbs. Height 16.6 – 74 in. 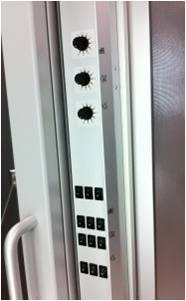 A geared center column can be convenient in a tripod dedicated to a test lab. The built-in spirit level is valuable for leveling the tripod: If the base (where the head is mounted) is level, fine adjustments are much easier to make because head movements (swivel, etc.) don’t interact. Manfrotto 3275 / 410 compact geared head with quick release – supports 11.1 lbs. Especially nice for making precise adjustments; more expensive than comparable pan-tilt heads, but worth every penny. Uses the 3271 quick release mounting plate. Get several of these. Solidtrax Video Tripod Dolly (shown above) is helpful when you have to move the tripod to various distances from the chart. Glide Gear Aluminum Track for use with the above dolly. Track for the dolly can also be built using 1-inch Schedule 40 PVC plastic pipe. regular quick-release tripod mount is appropriate for most cameras, a sturdy clamping system is needed for testing camera phones, webcams, and tablets. We put two of them together after rummaging through the aisles of Home Depot. They consist of Irwin Quick-Grip Mini or Micro bar clamps mounted on Manfrotto quick release plates. The images below give a good idea of how they’re constructed. A hole had to be drilled in the larger clamp (above) and enlarged in the lower clamp (below) to accommodate the 1/4 inch bolt. The larger clamp (the Mini) is sturdier, and has proven to be more useful. Recently (since we build these clamps) clamping devices have become available, for example, the Manfrotto TwistGrip Tripod Adapter Clamp for Smartphones. The image below summarizes how the lights should be positioned. The goal is even, glare-free illumination. The lamps represent the stacks of three SoLux track lamps, described above. This may involve a tradeoff, especially with wide-angle lenses. Lighting angles between 35 and 45 degrees work well for normal and long lenses. Avoid lighting behind the camera, which can cause glare. Ambient light should be kept subdued. Check carefully for glare and lighting uniformity before you expose, especially with wide angle lenses, where glare can be difficult to avoid: you may have to move the lights further than normal from the target— or allow glare in portions of the target, taking care that it doesn’t affect critical areas. Use the meter to check for the evenness of lighting. ±20% over the entire target is sufficient for SFR and Distortion measurements, where small portions of the target are analyzed and exposure is not critical. 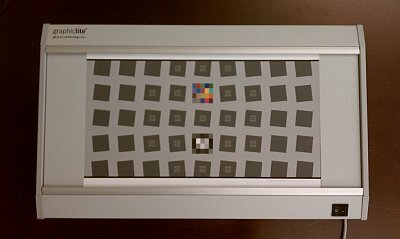 ±5% or better should be the goal for tonal and color measurements (Stepchart, Colorcheck, and Multicharts). This should be easy to achieve because illumination only needs to be even on the relatively small charts themselves, not on the entire target. The widest (the Kodak Q-14) is 14 inches (35 cm) wide; most are under 11 inches (28 cm). Lighting uniformity is strongly affected by the distance and orientation of the lamps. Our lamps are roughly 50 inches (125 cm) from the center of the target. Charts are mounted on 40x60 inch (100x150 cm) or 30x40 inch (75x100 cm) 1/2 inch (1.25 cm) thick foam board, which is lightweight, rigid (unlikely to warp), and easy to find at art supply shops. 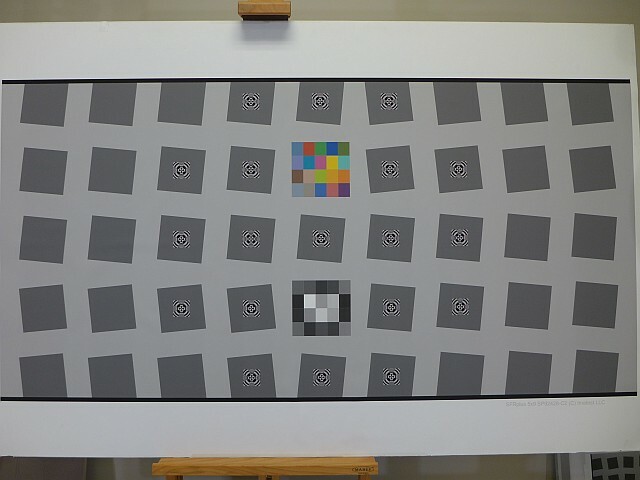 In some cases, the charts are mounted on neutral, middle gray (~18% reflectance) mat board, which is attached to foam board, to ensure correct exposure in camera phones and webcams with autoexposure. Charts are mounted using permanent double-sided tape or spray adhesive, available from hardware and art supply stores. We have used 3M 45 and 3M Photo Mount sprays, both of which are “Photo safe.” 3M Super 77™ is not labeled “Photo safe,” (and can’t be sold in California), but it should be OK for attaching gray mat board to foam board. A “Double Bubble Level” costs about $30. This trick uses rope and mirrors, as well as the red dots • that mark the horizontal center of the target (or whatever marker you choose). This is as close to smoke and mirrors as Imatest gets. The cord should be about 1 meter long and have a small weight on one end. A heavy nut— the type that mates with a bolt, not the type that grows on trees— serves well. Hold the cord in front of the camera (between the camera and mirror), and align your eye and the cord so the so the cord passes in front of the horizontal center markers (red dots • in the images), and so the reflection of the cord passes directly behind the cord. The camera is positioned properly if the center of the lens is aligned with the cord. If it isn’t, shift the camera horizontally until it is. To complete the horizontal adjustment, rotate (pan) the tripod pan/tilt head so the chart is centered in the image frame. At this point you should be close enough to correct alignments so the final, fine adjustments should proceed quickly. Glare in the outer patches can ruin measurements. With semigloss charts i’s hard to avoid, even with careful lighting placement. You can reduce it by decreasing the angle between the lights and the chart, but this may make the illumination less even. For this reason matte charts are often recommended when wide angle lenses are being tested (this includes most camera phones). The charts on the right can be analyzed with Imatest Stepchart, Colorcheck, Multicharts, or Multitest. They are mounted on neutral middle gray (~18% reflectance) mat board, which is mounted on foam board for rigidity.